a. Italian and Hungarian are recognised as official languages in the residential areas of the Italian or Hungarian ethnic minority. b. Slovenian tolar prior to 2007. 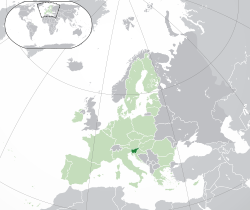 Slovenia is a country in Southern Europe. The capital and largest city of Slovenia is Ljubljana. Its major language is Slovenian. Their population is right now about 2.0 million. Slovenia's leading exports are manufactured goods and aluminium. A very long time ago, Illyrian and Celtics tribes lived in Slovenia. In the 1st century BC, Slovenia was ruled by the Romans. In the sixth century AD, Slavs lived there. Slovenia was ruled by Austria from 1335 until 1918. In 1918 it became a part of Yugoslavia. During World War II, Italy, Hungary and Germany took parts of the country but in 1945 it became part of Yugoslavia again. In June 1991, following a 10-day war, Slovenia became an independent country. Currently it is considered the most advanced country from what is called "Ex-Yugoslavia."[source?] It is also a member of the European Union. France Prešeren (1800-1849) is a very famous poet in his country. ↑ As defined by the Act Regulating the Coat-of-Arms, Flag and Anthem of the Republic of Slovenia and the Flag of the Slovene Nation ("Zakon o grbu, zastavi in himni Republike Slovenije ter o slovenski narodni zastavi") from 1994 and published on the web page of the National Assembly of Slovenia. ↑ "PisRS". Pisrs.si. http://www.pisrs.si/Predpis.aspx?id=ZAKO365&pogled=osnovni. Retrieved 2 June 2012. ↑ Božič, Dragan (3 November 2010). "Katero kitico č'mo kot himno zapet' [Which Stanza Should We As the Anthem Sing?]" (in Slovene). ISSN 1854-6544 . http://www.delo.si/clanek/127578. Retrieved 14 February 2011. ↑ Škrinjar, Klara (3 September 2012). "Zdravljica v političnem in pravnem primežu [Zdravljica in the Political and Legal Vice]" (in Slovene). Delo.si. http://www.delo.si/novice/politika/zdravljica-v-politicnem-in-pravnem-primezu.html. ↑ "Census 2002: 7. Population by ethnic affiliation, Slovenia, Census 1953, 1961, 1971, 1981, 1991 and 2002". Statistical Office of the Republic of Slovenia. http://www.stat.si/popis2002/en/rezultati/rezultati_red.asp?ter=SLO&st=7. Retrieved 2 February 2011. ↑ "Površina ozemlja in pokrovnost tal, določena planimetrično, 2005 [Surface area and land cover determined planimetrically, 2005]" (in Slovene, English). Statistical Office of the Republic of Slovenia. http://www.stat.si/letopis/2010/01_10/01-03-10.htm. Retrieved 2 February 2011. ↑ "Official Population Cloc". 26 September 2012. http://www.stat.si/. ↑ "Gostota naseljenosti, 1. 7. [Population density, 1 July]" (in Slovene, English). Statistical Office of the Republic of Slovenia. http://www.stat.si/letopis/2010/30_10/30-09-10.htm. Retrieved 2 February 2011. ↑ 10.0 10.1 10.2 10.3 "Slovenia". International Monetary Fund. http://www.imf.org/external/pubs/ft/weo/2013/01/weodata/weorept.aspx?pr.x=24&pr.y=17&sy=2012&ey=2012&scsm=1&ssd=1&sort=country&ds=.&br=1&c=935%2C939%2C936%2C961&s=NGDP%2CNGDPD%2CNGDPPC%2CNGDPDPC%2CPPPGDP%2CPPPPC&grp=0&a=. Retrieved 17 April 2013. ↑ "Human Development Report 2010". United Nations. 2010. http://hdr.undp.org/en/media/HDR_2011_EN_Table1.pdf. Retrieved 2 November 2011. ↑ Melody by Stanko Premrl. The question whether the entire Zdravljica or only its seventh stanza constitutes the Slovenian national anthem, remains unresolved. Whereas the Constitution of Slovenia determines the title of the poem, the act about the anthem specifically determines its seventh stanza. It has been argued that the act contradicts the constitution and that the question should be resolved by the Slovenian Constitutional Court. This page was last changed on 11 December 2014, at 05:13.